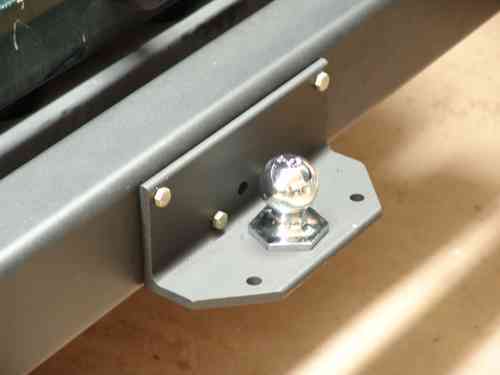 I designed and made this simple bracket to mount a hitch ball on the stock bumper of my 2003 Jeep Wrangler. The bumper-mount design is not for hauling a heavy trailer, but it works fine with very light loads, such as my 1000-pound inflatable-boat rig. I would not use it for anything heavier; the bumper mounting does not supply the rated strength of a frame-mounted hitch. Doing your own cutting requires a metal-cutting band saw. I use calipers and a carbide scribe to mark the bevel cut lines, guide the cut by hand through the saw, and smooth and straighten the cut with a hand file. Doing your own drilling requires at least a drill press (or better, a mill-drill or milling machine) since the 1-inch hole for the hitch ball shank is more than a handheld power drill can manage. I chose the ball with the 1-inch shank since it also fits the common Class III drawbars. You can also get hitch balls with 3/4 inch shanks made for Class I hitches, so you have a smaller hole to drill; either size is adequate for this bracket's capacity. I finished the piece with Extend rust converter spray, which converts the mill finish to an excellent corrosion-resistant surface, topped with a few coats of flat black Rustoleum spray paint to match the dull black Jeep bumper style. Mounting the bracket to the bumper requires drilling four holes through the sheet metal bumper and attaching the bracket with 3/8 inch x 1-1/4 long bolts. I provide a drill template in the drawings below. Center the template on the bumper and faster with tape. Center punch dimples through the template into the bumper. I drilled the holes in steps of 1/8, 1/4, and 13/32. The 13/32 hole is a bit larger than the 3/8 bolts, to provide clearance for the actual hole placement. I used Grade 5 bolts since ungraded hardware is not suitable for load-bearing applications. This bracket design should also work on any vehicle with a sturdy vertical bumper face than you can drill and bolt onto. 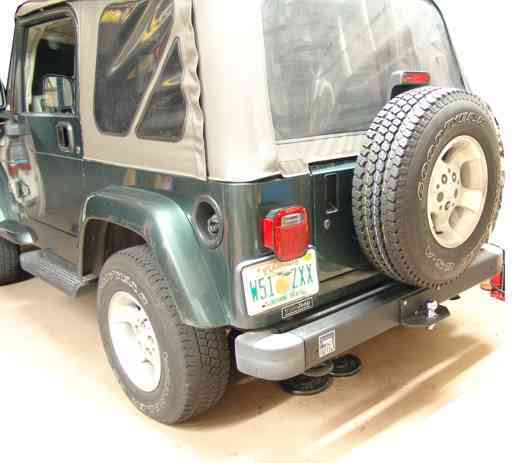 The bottom of the spare tire on the back door of the Jeep hardly clears the top of the coupler on the trailer tongue, so to join the trailer to the vehicle requires that you open the door and swing the spare tire away first. I do this with the trailer at a bit of an angle, which lets the door clear the winch post on the trailer. Mechanical drawing (PDF file, 4 pages, 215 KB). This drawing consists of 4 pages, including drill templates. Have a comment or question about my Jeep hitch? Did you actually make one?